Monday noon - 7 p.m.
Tuesday noon - 7 p.m.
Wednesday noon - 7 p.m.
Petrone from UK. Sent 20 Aug 2014. [Currently under renovation. Temporary home in a shipping container.] They hope to move back inside in November. Fortunately, they only rent the premises so the renovation hasn't cost them. Meantime, they're open 12 til 7, closed Sun., dealing from the cabin with a couple of tables outside. Marko from Amsterdam. Sent 28 Sep 2008. I have been buying (and smoking) weed from Yo Yo for twenty years or so. It used to be an abandoned house which was then squatted (kraak pand in Dutch) and then legalized a long time ago by the people running it (former members of kraak movement). Important thing about Yo Yo is that they only sell weed grown outside (so no heavy, lamp grown stuff). A while ago they introduced hashish as well (I don't smoke hash so can't tell you about the quality of it). Weed however is excellent (how our parents used to smoke), pure high and when the effect wears off it's as if you have not smoked at all (no side effects like paranoia, confusion and the like). People who smoke indoor weed don't like it because it's not strong enough - I would say it is just how weed ought to be, light, inspirational, friendly. For what it's worth I would like to include this comment about Yo Yo for all those relaxed, easy going, old fashioned weed smokers visiting Amsterdam. Yo Yo also helps young artists (painters, photographers) exhibiting their work. 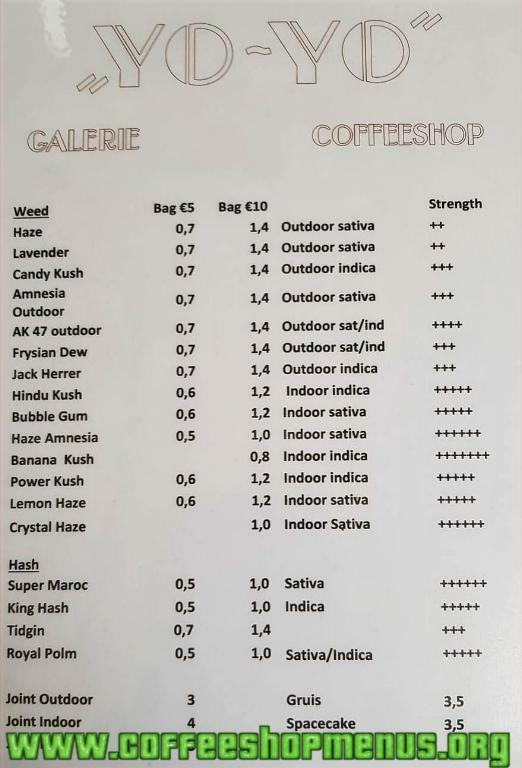 My personal favourite is Hindi-Kush. Top marks for this one. White Widow was fantastic, a heavy buzz but not uncomfortable. 10 euros bought me two huge buds. Coffee good, shop a little dull though service pleasant. Wasn't open some evenings. A bit off the well beaten tourist path, secluded on a leafy quiet street in a residential district. Really chilled out place and lovely to while away a lazy afternoon watching the world go by. Didn't buy any weed but had a lovely coffee and joint of NYC Diesel I'd purchased earlier. Highly recommend this place. Roy from Australia. Sent 22 Mar 2005. Laid back and easy. The smoke is fine and the atmosphere very calm and laid back. On a nice street near the Albert Cuyp markets with great apple pie. A lovely place to while away a rainy day. Stephen and Sonja from USA. Visited Mar 15. Sent 21 Mar 2005. Visited because of all the positive reviews seen here and elsewhere. The blonde woman working there must have been having a bad day, for she was a bit cold. Didn't try the weed, but the OJ is good and the apple pie just ok. Not really worth the trip since there are so many better shops closer to Centrum. Keith from Ireland. Sent 8 Feb 2005. Really cool little place. I've been there three times and each time it has been empty which is perfect, if you're seeking out smoking solitude. Really sweet organic weed, try the Sunlight early in the morning, its a must! MailDan from USA. Sent 4 Dec 2004. Just a short walk from the Sarphatipark, a friendly coffeeshop that is much quieter than those in the center. Check snacks, 'organic herb'. Roy from Australia. Visited Nov 04. Sent 30 Nov 2004. A real neighbourhood style shop just around the corner from Albert Cuyp market with none of the commercial overtones of places nearer the centre. Their grass is quite good and much cheaper than in the centre. It's probably not the place to go if you are seeking that particular strain of whatever but it's a light and airy well run shop with friendly staff. They have separate smoking and non-smoking areas. In a nice quiet street with big windows to watch the bicycles go by and wonder how to find your way home. Nick from UK. Sent 13 Oct 2004. A nice quiet shop where we were greeted by a lady baking fresh cakes & pastries- lovely! Had some good Bubblegum here and the nicest Dutch Appeltaart you could ever hope to eat! Worth it just for the food! Keen to go back!